Due to the Environmental Protection Act of 1990, restaurants, takeaways and any other food and drink premises must take measures to ensure they are compliant. This means that your business must have an adequate ventilation system in place to deal with odours, fumes and also noise which are created by your daily operations. 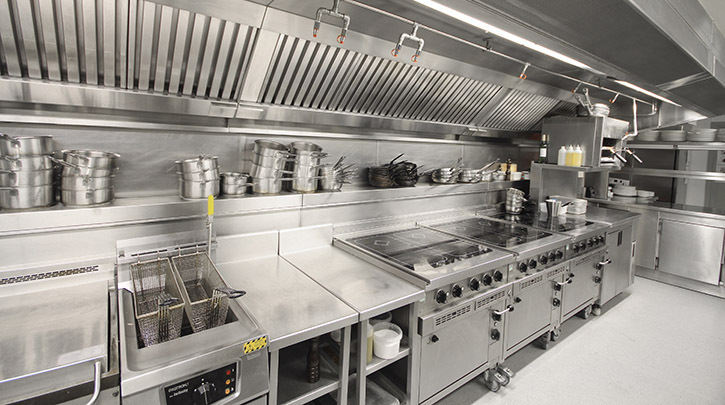 KES Facilities have fabricated numerous kitchen exhaust systems and as such are well versed in meeting regulations when designing and installing a new system. When creating your new exhaust system we will include all required features such as a canopy to direct cooking fumes and a grease filter to collect cooking grease so that it can be removed and disposed of correctly. Catering equipment exhaust regulations are both extensive and strict. It is vitally important that your company is compliant or you may face legal action or face complaints from neighbours. With so many regulations to meet, why not let us advise you and talk you through the process, taking the stress off your shoulders and providing you with an installation which is of the very highest standard and also gives you complete peace of mind?